Two djs will comprise the line-up of the coming Popperola Party, which will be held to celebrate my first, true rebellious – as well as arrogant – gesture in life, namely waiting until leap day 1976 to pop into this world. These two admirable persons are Raoul Belmans and Stefan Goldmann. The venue is Club Montreal in Leuven, Belgium. 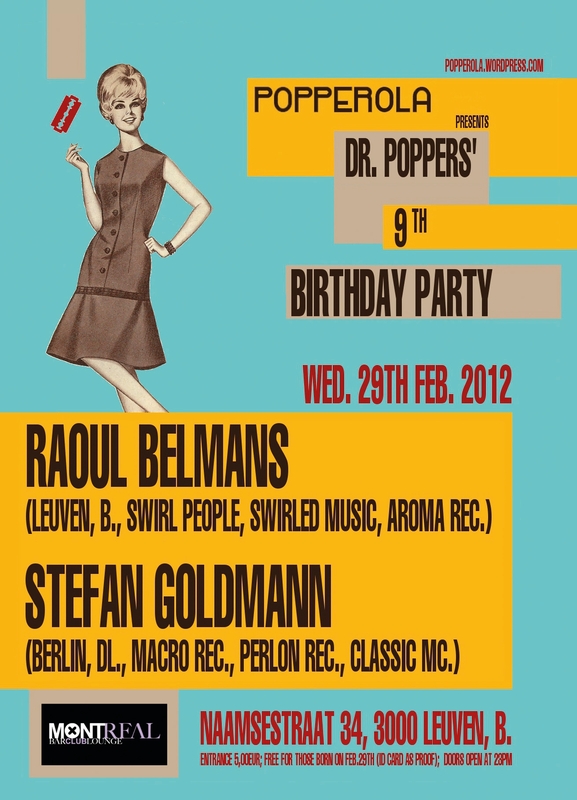 Raoul Belmans is without doubt a familiar name to house aficionados. After all, his career as a disc jockey, producer and label owner goes back more than two decades. He earned his name as a resident of the influential Belgian party provider Food, as a part of the producer’s duo Swirl People and as head of the label Aroma Records. He has released numerous 12inches and albums on labels such as Wally’s Groove World, Sole Music, Panhandle, Seasons, Music For Freaks, Lowdown Music, Oomph, Amenti, Odds & Ends and We Play House. Nowadays, Raoul is also running his own digital imprint Swirled Music. Regularly he travels to parties worldwide to enthuse people with his impeccable technique and his funky, deep but also broad selection of music. Lovable, warm-hearted, open-minded and witty: that’s Raoul Belmans, like that is his music. From Berlin, Stefan Goldmann will give his first Belgian performance on this extraordinary occasion. Stefan is a prolific producer, who has pleasured us with a rather unusual kind of house music such as the tracks ‘Lunatic Fringe’, ‘Sleepy Hollow’ and ‘The Maze’. It appeared on labels such as Classic Music Company, Perlon, Victoriaville, Cocoon, Mule and of course Macro Records which he runs together with Finn Johannsen. Macro is a label with a well-defined identity and was responsible for important releases by Raudive, Elektro Guzzi, Peter Kruder and Namlook. It has its own monthly Friday night at Berlin’s Panorama Bar. As Goldmann has a strong musical background, his material is often highly conceptual and thought-provoking but he invariably succeeds in making it sound as simply good music. Last year, the man did not go unnoticed at the German Time Warp festival and even in Ibiza, he produced groundbreaking work such as the double 12inch ‘The Grand Hemiola’, he mixed a compilation for Macro, he wrote texts on music sociology for Little White Earbuds as well as for the flyers of the club Berghain and he offered the world unreleased music by his late dad, a composer of contemporary classical music. At this moment, Stefan is preparing a new album. In the next weeks I’ll supply you with additional info, words and other stuff about the Popperola party. And of course I hope to see you there!